The South Carolina Spinal Cord Injury Association is a chapter of United Spinal. 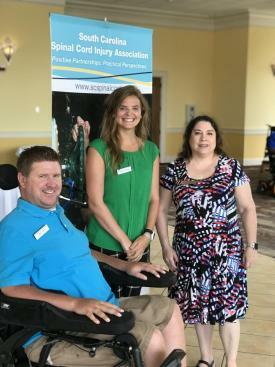 Through the services of the South Carolina Spinal Cord Injury Association, individuals with spinal cord injuries find a valuable resource for their needs, questions, and concerns. They discover a powerful source of strength through others who have experienced similar life-altering injuries. We also provide information, education, and support to family members and professionals who serve those with spinal cord injuries. The South Carolina Spinal Cord Injury Association is a 501 c (3) non-profit organization. Building connections in the community through education, awareness, and peer support.